The Supreme logo is easy to spot, but did you notice the Nike OG Cortez sneakers? Apple’s holiday ad for 2018 is, at first blush, a charming story of a young woman learning to embrace her artistic gifts. She toils away for a year on a mysterious creative project, only to be held back by her own insecurities about letting others see what she has been working on. 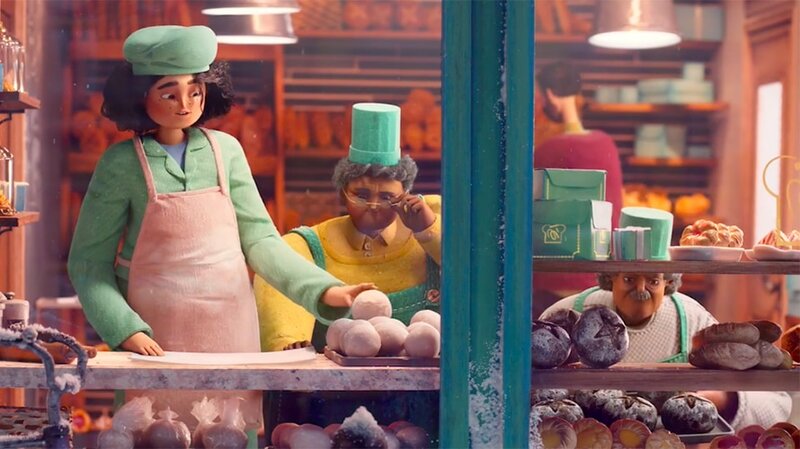 But the relatable story’s fairy-tale vibe and immersive narrative can distract first-time viewers from noticing just how many fun and esoteric visual references are hidden throughout the 3-minute ad. 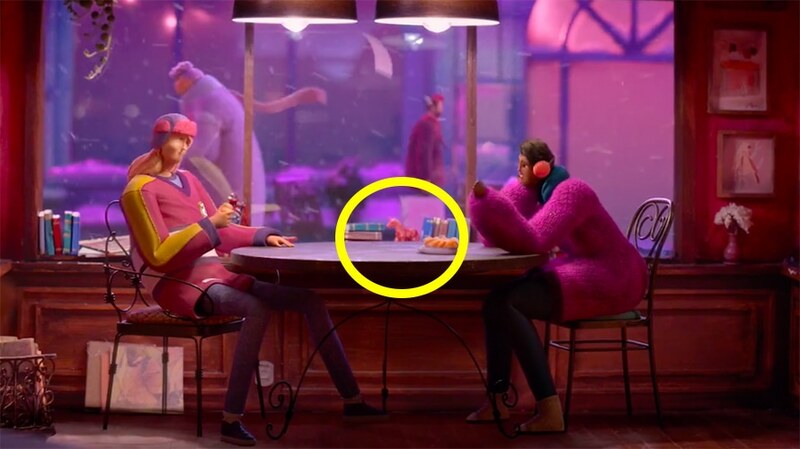 Most of these Easter eggs are meant to subtly convey the character of Sofia, whom the creators—Apple creative agency TBWA\Media Arts Lab and animation house Buck Productions wanted to imbue with unique personality rather than just making her a generic figure. But some of the hidden images also offer intriguing peeks into the creative minds behind the ad. 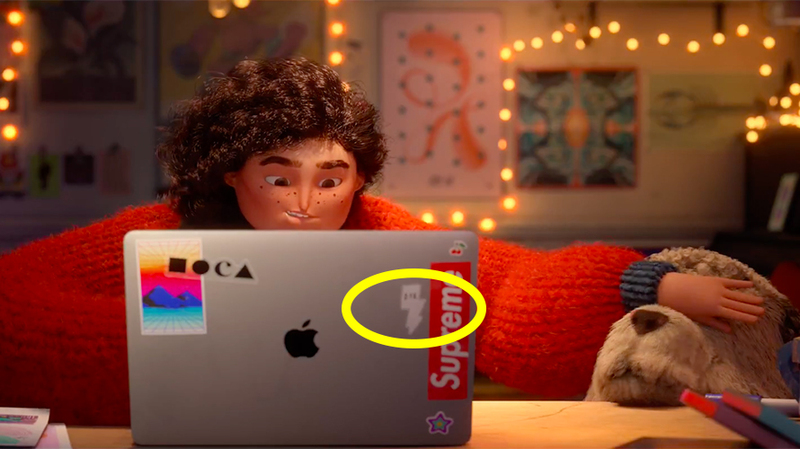 Before we dive into the list, let’s all agree to skip the Supreme logo on the back of Sofia’s laptop, as it’s far too obvious to be considered an Easter egg. 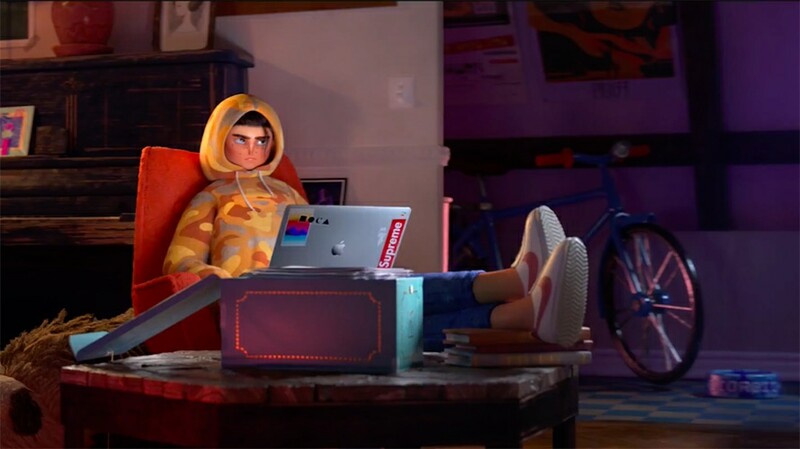 But it does help establish quickly both that this story takes place in the modern era and that the main character has interests in the streetwear vein. 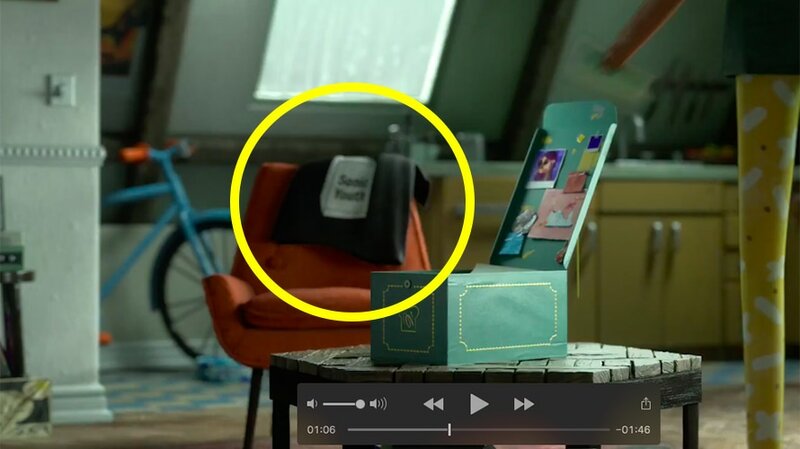 The logo for DFA Records, label for LCD Soundsystem and more, is a sticker on the back of Sofia’s laptop, placed to give an early hint of her musical tastes. 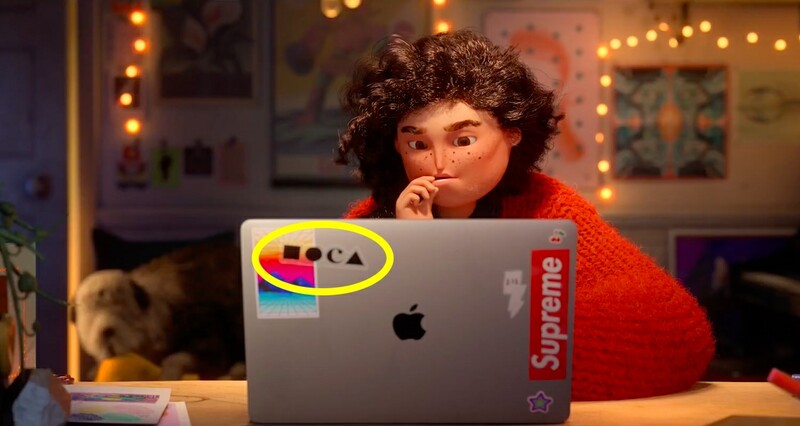 One of the most prominent but somewhat cryptic stickers on her laptop is for MOCA, the Museum of Contemporary Art in L.A. The sticker is both a sign of Sofia’s artistic interests and a hometown shout-out from the spot’s creative agency, Los Angeles-based TBWA\Media Arts Lab. A poster featuring the cover art for 2018 album Lamp Lit Prose, by experimental rock band Dirty Projectors, can be seen near Sofia’s desk. 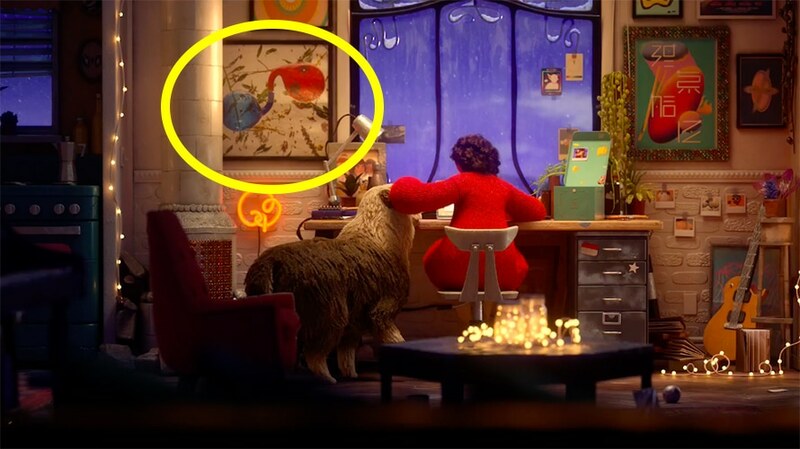 Hanging over her couch is a poster of the artwork from another 2018 album, Flow State by Australian singer-songwriter Tash Sultana. 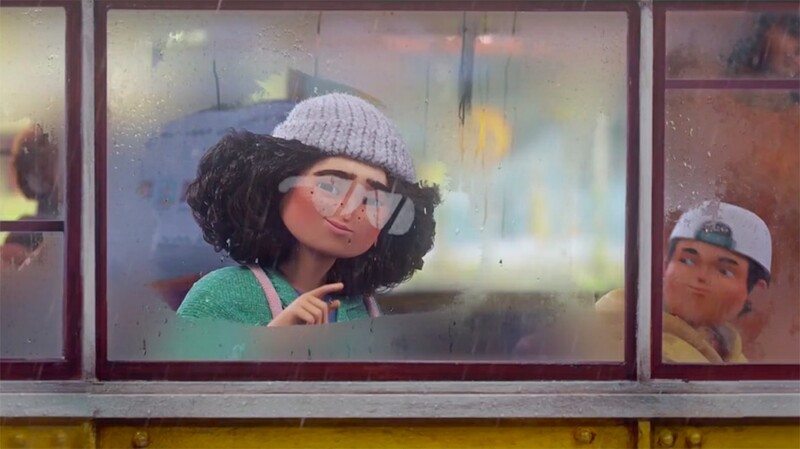 To show time passing over the course of the ad, Sofia’s wardrobe changes with the seasons. The ad’s creators looked at streetwear trends and fashion magazines for inspiration on her different looks. 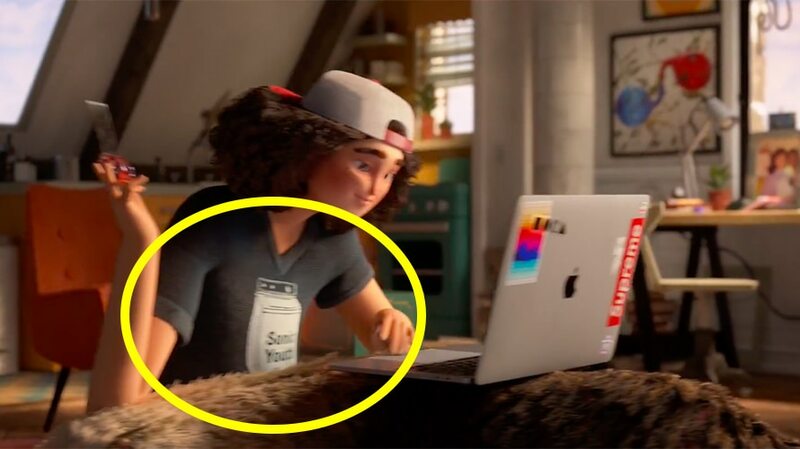 While it’s not exactly hidden, Sofia’s Sonic Youth shirt might be easy to miss on your first viewing, especially since it’s on the screen so briefly. The shirt is from the band’s 1995 album Washing Machine, whose cover showed two young fans wearing the same shirt that Sofia is wearing in the ad. Why did the T-shirt predate the album itself? Because Sonic Youth had been toying with the idea of changing its name to Washing Machine, but then decided to just make that an album title instead (much to their record label’s relief). The Sonic Youth shirt pops up again in the next scene, draped over the back of a chair. 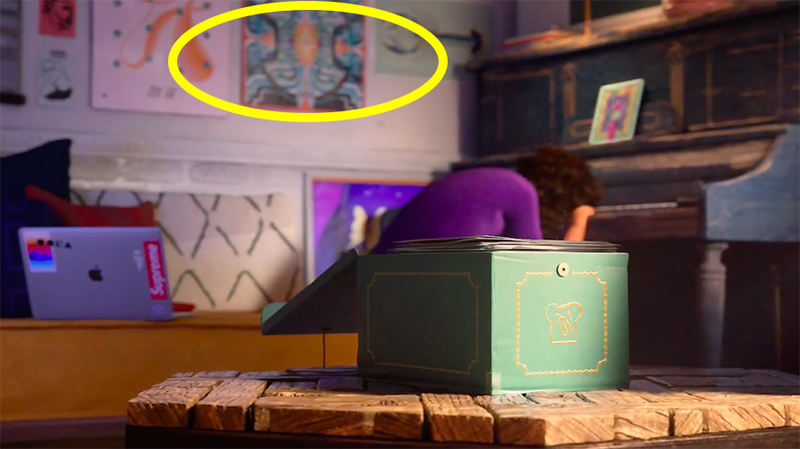 The box storing Sofia’s mysterious creations is from the bakery where she works. 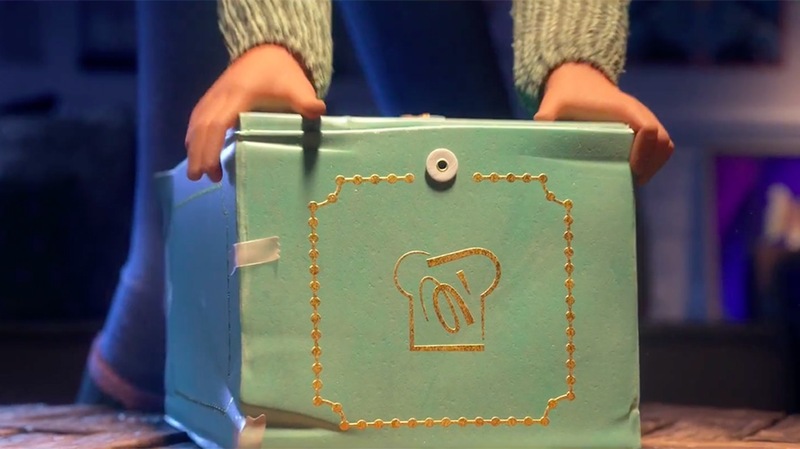 In the bakery scene, you can see the same logo on the window and similar boxes sitting around the shop. Sofia’s coworkers at the bakery are the same couple who catch her paper at the end. 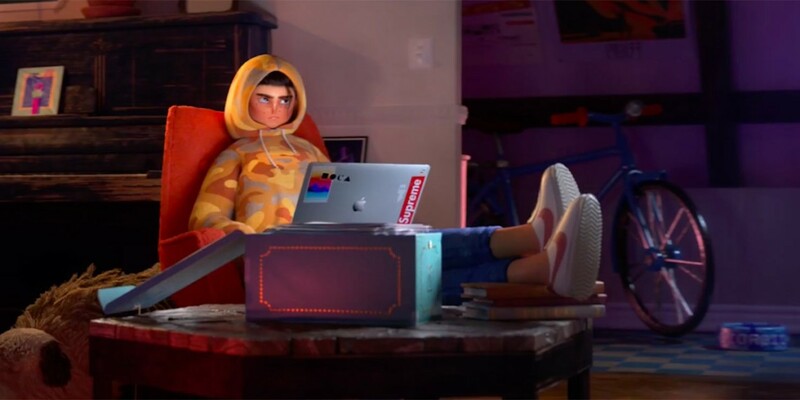 In the scene where Sofia pulls her hoodie closed over her face, sneakerheads might notice she’s wearing a pair of Nike OG Cortez running shoes. a modern homage to Nike co-founder Bill Bowerman’s revolutionary 1967 design, the Tiger Cortez. All trademarked products and images in the ad were, of course, cleared in advance with the owners of the intellectual property. 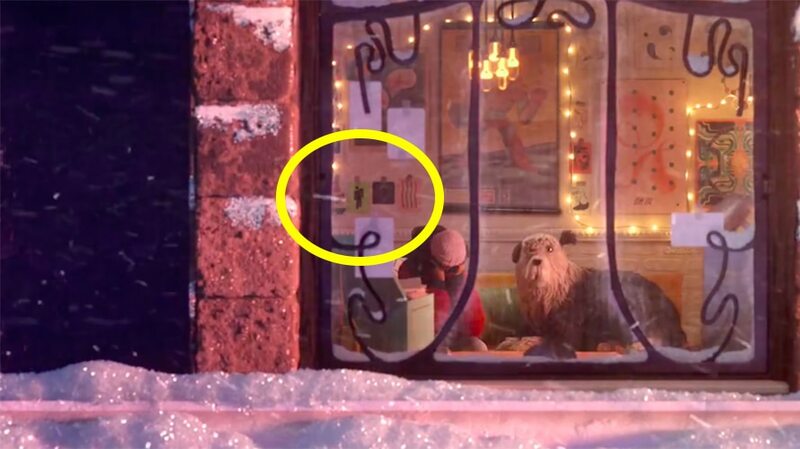 In the scene at 1:25 looking in through Sofia’s window, you can see musician Billie Eilish’s logo (a black silhouette of a leaning person on green background) on the wall behind her. Eilish, a 16-year-old rising star with more than 650 million YouTube views n her music, wrote the song “Come Out and Play” specifically for this ad. I’m told by the ad’s creators that there is a unicorn hidden in each of the physically designed sets. Some are supposedly a bit more obvious than others. So far I’ve only spotted the one above, but maybe you’ll have better luck. 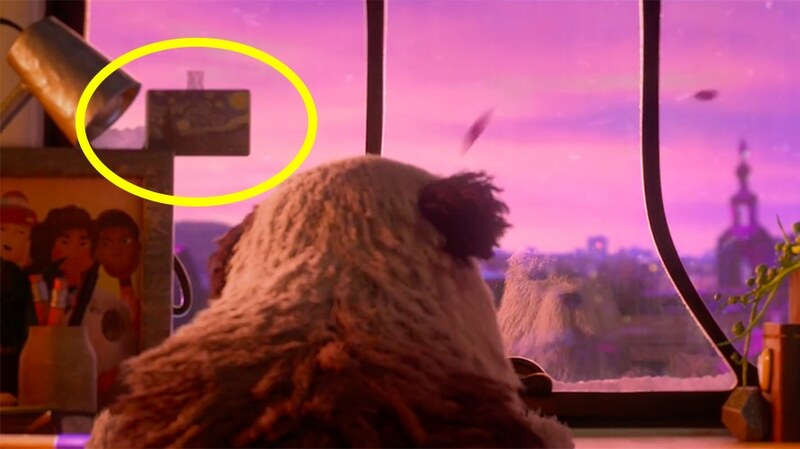 Spot any more interesting Easter eggs? 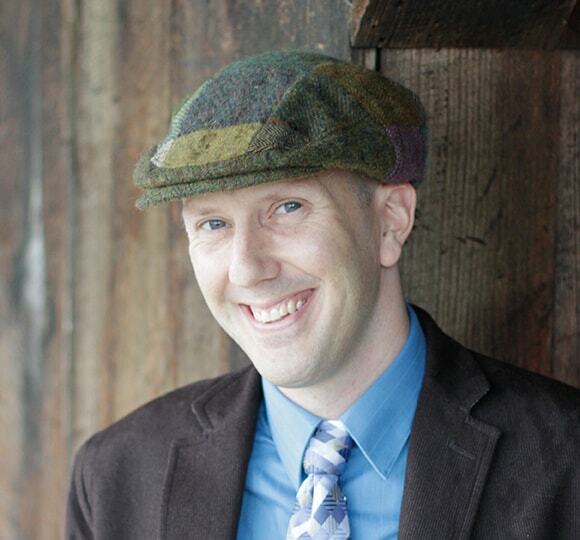 Hit me on Twitter at @griner and I’ll add any good ones you’ve found.